Look at how big this pig is! I think he’s about 900 pounds and not someone I would want to mess with if he was mad. I spent some time in Ohio recently visiting family and I found a farm animal sanctuary in Ravenna, Ohio. 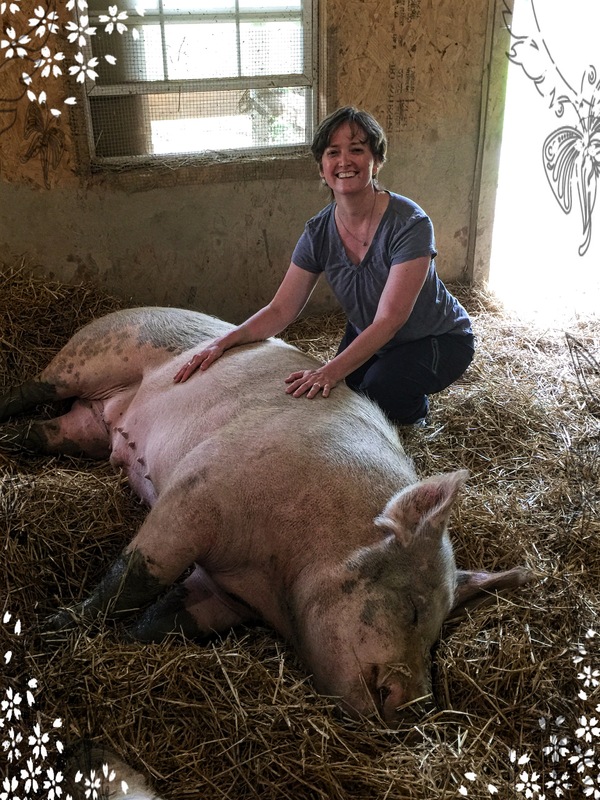 I was hoping to hug a cow when I was there, but they didn’t have any, so I got to get up close with a very large pig. They don’t have soft fur, it’s very wiry, but this guy was gentle as can be and really sweet. Maybe it’s just my personality, but I can’t imagine caring for something and getting to know another living being and then having it for dinner. I just can’t do that. Call me a wuss, call me over sensitive, call me unrealistic, I don’t care, I’ll own it all, but I just can’t do that stuff. It was a good visit up north, seeing family and friends, and the weather was SO NICE. Hardly any humidity and only light rain. So awesome. I’ve missed my puppies though and I am happy to see them again. A day of rest today before it’s back to my regular every day programming.